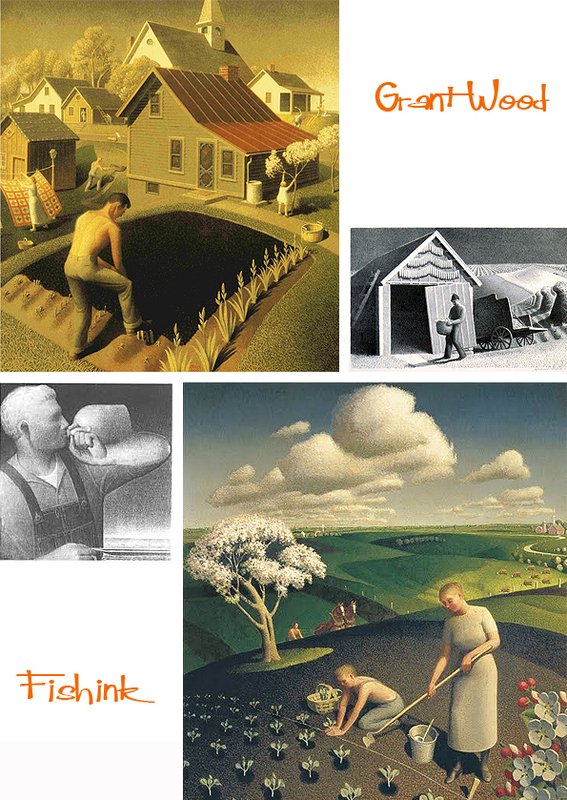 Grant DeVolson Wood (February 13, 1891 – February 12, 1942) was an American painter born four miles east of Anamosa, Iowa. 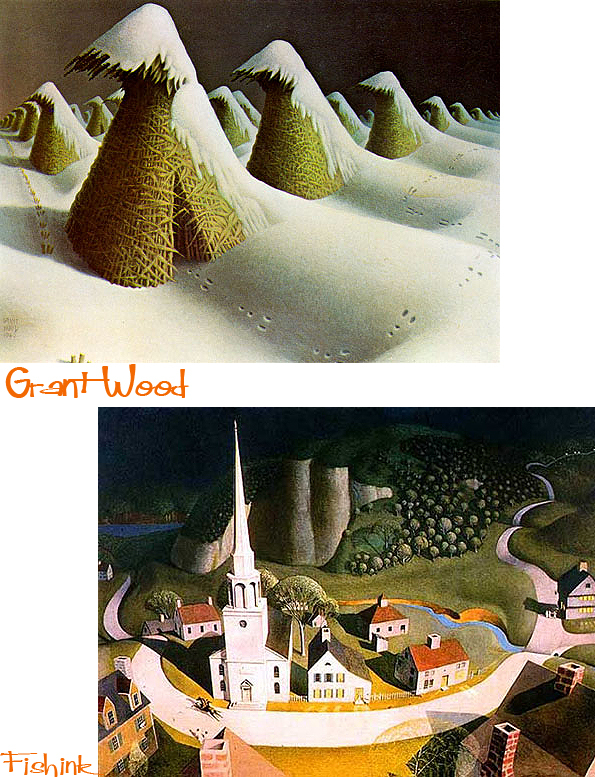 Wood’s best known work is his 1930 painting American Gothic, which is also one of the most famous paintings in American art, and one of the few images to reach the status of universally recognised cultural icon, comparable to Leonardo da Vinci’s Mona Lisa and Edvard Munch’s The Scream. It was first exhibited in 1930 at the Art Institute of Chicago, where it is still located. It was given a $300 prize and made news stories country-wide, bringing Wood immediate recognition. Since then, it has been borrowed and satirised endlessly for advertisements, cartoons even depicted on buildings and as statues. 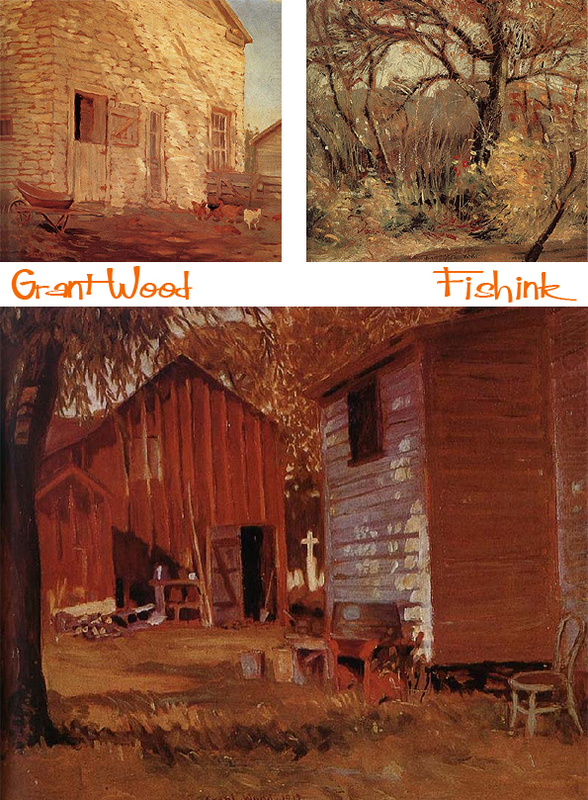 Wood’s inspiration came from a cottage in Eldon, Iowa designed in the Gothic Revival style with a distinctive upper window and a decision to paint the house along with the kind of people that the artist felt should live in that house. The painting shows a farmer standing beside his spinster daughter. The figures were modeled by the artists’ sister and dentist. Each element was painted separately however the models sat separately and never stood in front of the house. 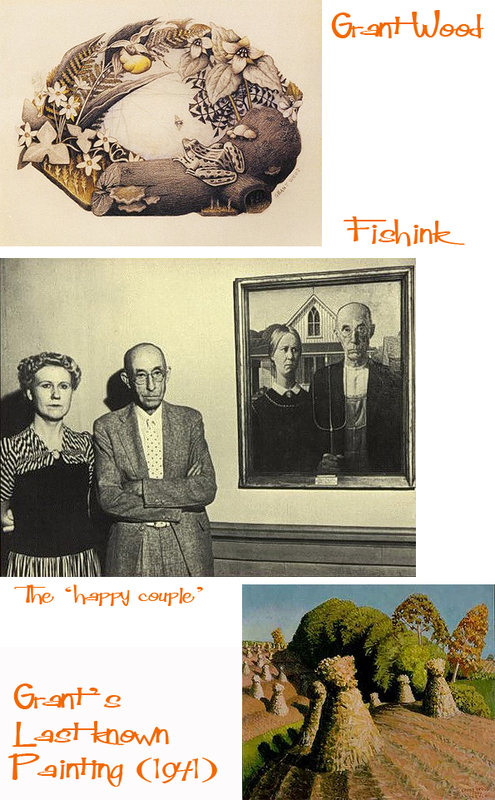 Interestingly, Wood’s sister insisted that the painting depicts the farmer’s daughter and not wife, disliking suggestions it was the farmer’s wife, since that would mean that she looks older than Wood’s sister preferred to think of herself. The dentist, Dr. Byron McKeeby (1867–1950) was from Cedar Rapids, Iowa. The woman is dressed in a colonial print apron mimicking 19th century Americana and the couple are in the traditional roles of men and women, the man’s pitchfork symbolizing hard labour. His family moved to Cedar Rapids after his father died in 1901. Soon thereafter he began as an apprentice in a local metal shop. After graduating from Washington High School he enrolled in an art school in Minneapolis in 1910, and returned a year later to teach in a one-room schoolhouse. In 1913 he enrolled at the School of the Art Institute of Chicago and did some work as a silversmith. From 1920 to 1928 he made four trips to Europe, where he studied many styles of painting, especially impressionism and post-impressionism. But it was the work of Jan Van Eyck that influenced him to take on the clarity of this new technique and to incorporate it in his new works. 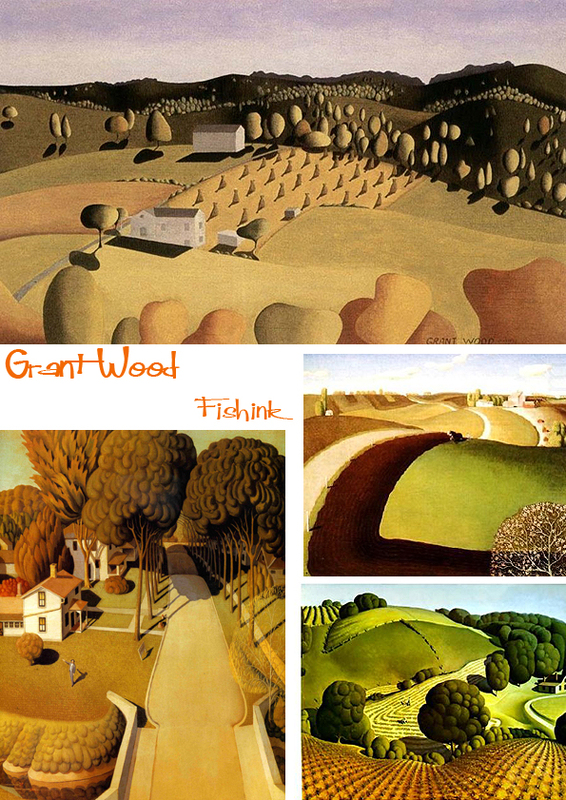 For me it’s not the people who I find inspirational in Grant’s work, its the observation of the rolling hills and lush countryside. 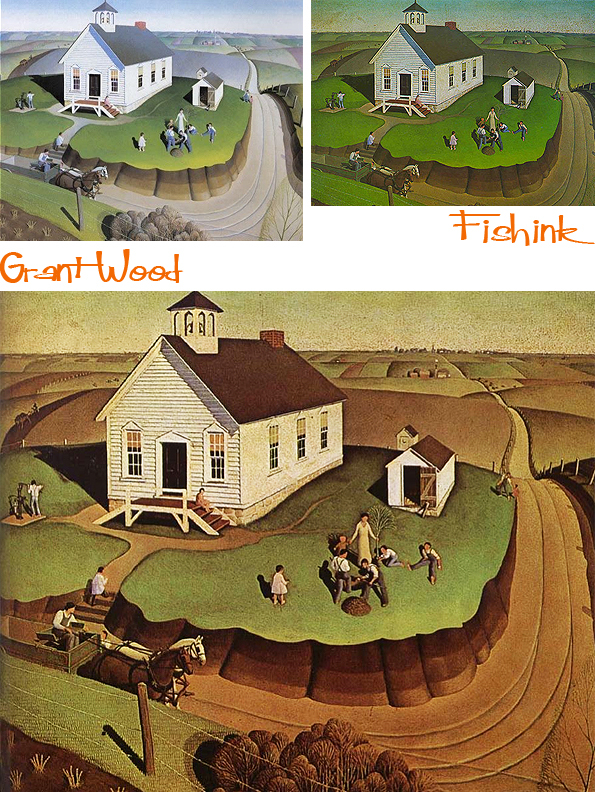 In fact the top image (below) was one of the first of Grant’s work that I came across and liked, back in the 1980’s. 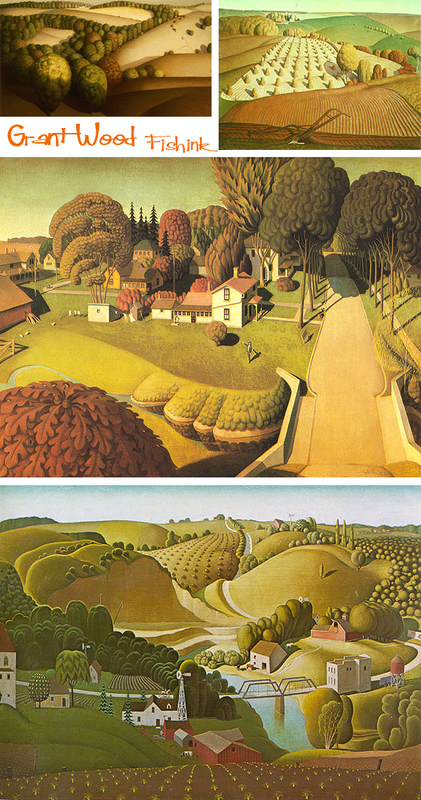 His work has visual links for me to paintings of the english landscape by Ravilious too. Theres a great drama from his use of perspective, simplification and generalisation of the landscape alongside his warm tones and colours. It’s sometimes hard to know what his real work look liked when you can find three versions on the internet alone lol, but I imagine the larger image from the three below is nearer the truth and the top left one has been ‘freshened’ to appeal to a new generation of admirers. 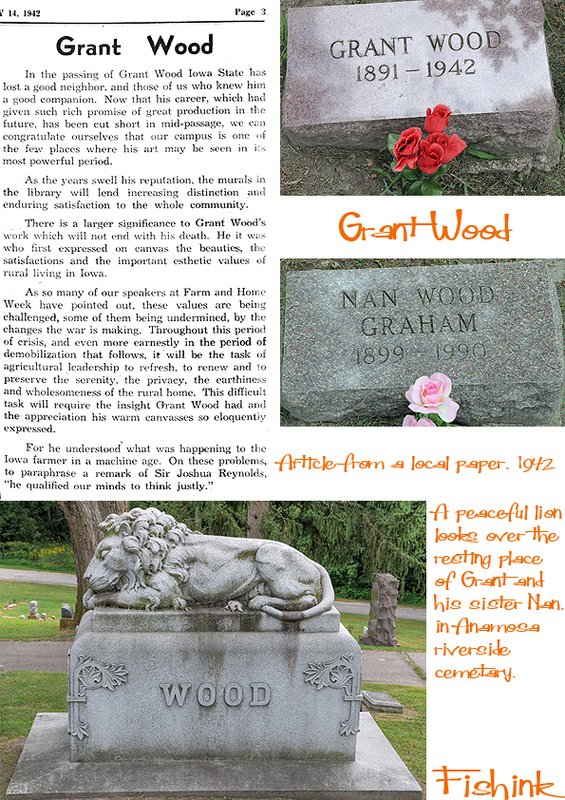 Grant worked largely within his local community. His work was a social record of life in that part of the work at that time, and he captured it (and often himself too) so well. From 1924 to 1935 Wood lived in the loft of a carriage house that he turned into his personal studio at “5 Turner Alley” (the studio had no address until Wood made one up himself). Thanks to Jennifer Black Reinhardt for these lovely images from her blog. 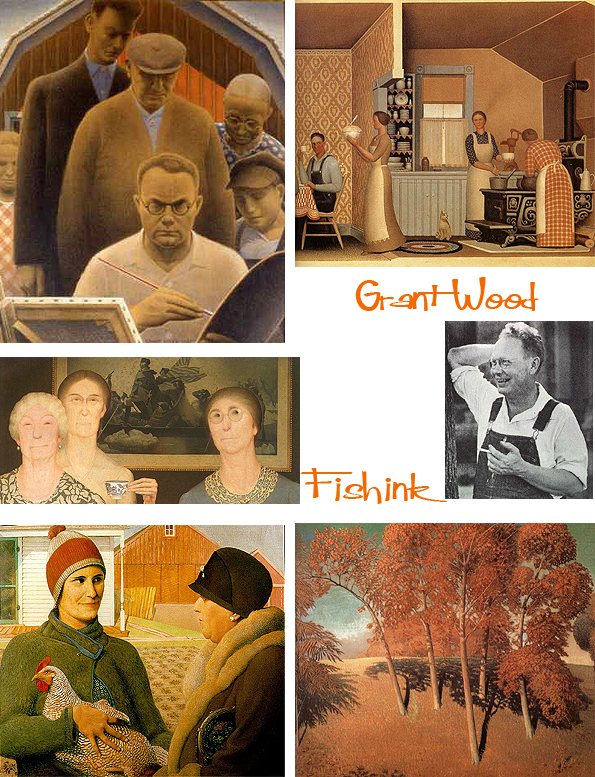 In 1932, Wood helped found the Stone City Art Colony near his hometown to help artists get through the Great Depression. He became a great proponent of regionalism in the arts, lecturing throughout the country on the topic. Wood taught painting at the University of Iowa’s School of Art beginning in 1934. During that time, he supervised mural painting projects, mentored students, produced a variety of his own works, and became a key part of the University’s cultural community. Throughout his life he hired out his talents to many Iowa-based businesses as a steady source of income. This included painting advertisements, sketching rooms of a mortuary house for promotional flyers and, in one case, designing the corn-themed decor (including chandelier) for the dining room of a hotel. 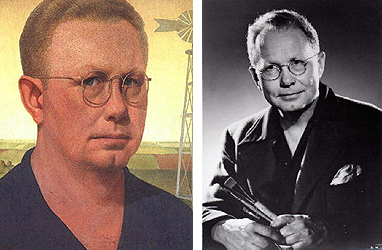 In addition, his 1928 trip to Munich was to oversee the making of the stained-glass windows he had designed The Grant Wood Window Drawings for a Veterans Memorial Building in Cedar Rapids. What a stunning window and apparently his sister (Nan) from ‘American Gothic’ fame is again the central figure in this piece. On February 12, 1942, one day before his 51st birthday, Wood died at the university hospital of liver cancer. 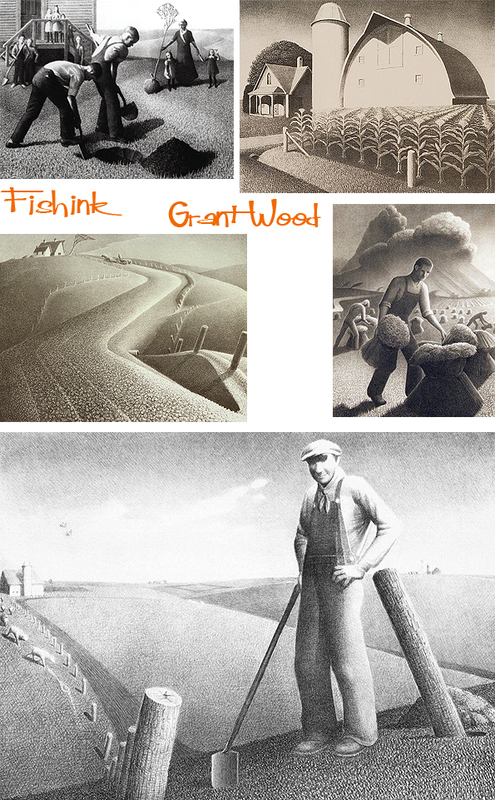 His estate went to his sister, Nan Wood Graham, and when she died in 1990, her estate, along with Wood’s personal effects and various works of art, became the property of the Figge Art Museum in Davenport, Iowa. When you read what was written in the local papers at the time, you can appreciate how much Grant had become a well known and well liked central figure in his community. Wood was an active painter from an extremely young age until his death, and although he is best known for his paintings, he worked in a large number of media, including ink, charcoal, ceramics, metal, wood and found objects. He understood the land and the people who worked on it. Here’s an unusual nature study I came across, a great photograph of Nan and the dentist who posed for ‘American Gothic’, presumably they were asked not to smile to look more like their portraits ! Thanks to Wikipedia for some of the information here. A wonderful view of a bygone era. Steinbeck’s The Grapes of Wrath also comes to mind. All said and done it still feels pretty ‘fresh’ to me for being over 80 years old. Any thoughts ? ← News updates on The York Open Studios, Mark Hearld, Emily Sutton. Freehand Book and Kate Bush. Really interesting, as always. An introduction to an artist I haven’t heard of. Thank you! Thanks Isobel. Appreciate you taking the time to tell me that you enjoyed the post and that you’d not previously heard of Grant’s work. Great to hear that I’m bringing new eyes to old work lol. Don’t forget to tell your friends about my blog too. Absolutely stonking- I’ve always loved that one of the three ladies with the tea cups- but that and American Gothic were the only works of his I’d come across- thanks for this, love the lot!